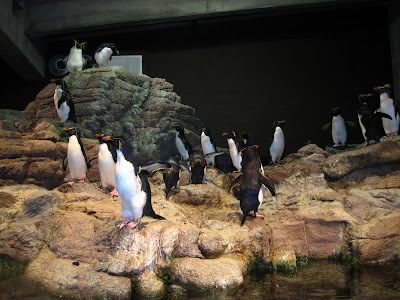 As you might have read in this earlier post, Heather and I drove 7 female rockhopper penguins from SeaWorld Orlando to the Aquarium in November of 2009 to increase the number of females in our colony. 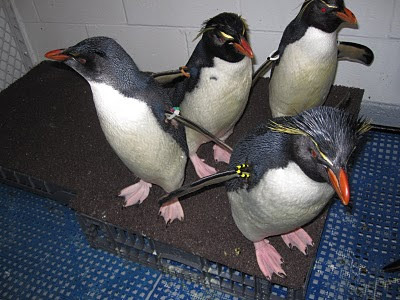 After a two day drive the rockhoppers were settled in behind the scenes for a 30 day quarantine (a standard procedure to ensure all new animals are healthy before they meet the rest of the colony) before they went on exhibit. The day of the big exhibit introduction was quite an event with plenty of media folks to document the happenings. Everyone around the Aquarium wanted to see how our NEA rockhoppers would react to the new SeaWorld additions. 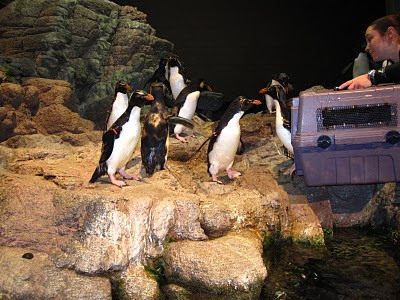 The carriers were opened and the new rockhoppers ran out onto the island. There was a lot of vocalizing and commotion and eventually everyone settled down. The island looks great with all the new rockhoppers. I am happy to say that the new females have settled in nicely with our existing rockhoppers. Although there is no romance yet we are hopeful that the addition of the females from SeaWorld will lead to breeding in years to come. That's a lot of rockhoppers! Click here and here to see a few articles written by the media present at the introduction.